The Shiny Vampire Club: Glam Fangs! 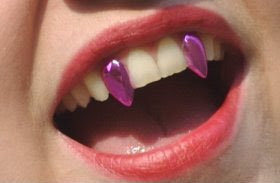 I know that vampires don't actually have fangs but wouldn't it be awesome to wear these for Halloween? I'm like ten seconds away from buying them. They're like SVC grills! Love them! NEAT!!! do they come in other colors? I want them! Fangs and wine- what a day! I dare someone to wear those to the grocery store! Holy Crap! I have a pair like those but they're silver! They came with a mold casting packet so you could mold them to your canines.